At a press event in Beijing on Tuesday, San Diego-based chip maker Qualcomm’s announced two systems-on-a-chip (SoCs) bound for future smartphones, tablets, smartwatches, and computers: The Snapdragon 660 and 630. Highlights include support for high-speed wireless, enhanced imaging, faster connectivity, and a cadre of processing improvements brought on by the new chips’ 14nm manufacturing process. 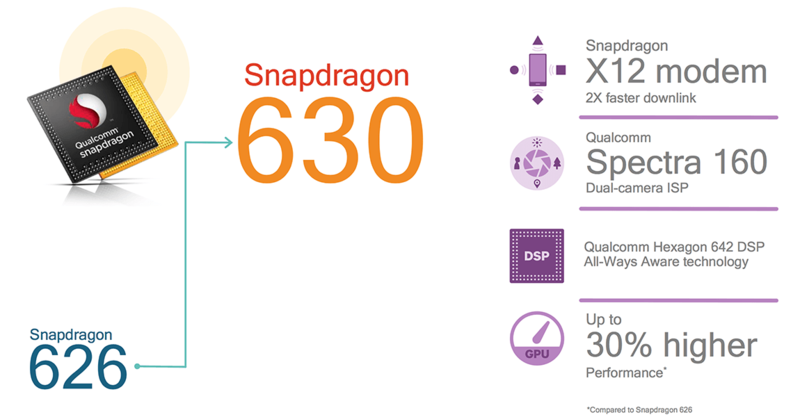 Architecturally, the Snapdragon 660 and Snapdragon 630 are different animals. The 660, a midrange performer, is an eight-core chip consisting of four of Qualcomm’s new Kyro 260 high-powered cores — cores which offer 20 percent higher performance, the company claims — clocked at 2.2GHz, and four power-efficient Kyro 260 cores clocked at 1.8GHz. It sports an Adreno 512 graphics processor, and a supports LPDDR4 memory running at 1,866MHz (up to 8GB). The 660 ships with another big exclusive: Qualcomm’s Hexagon 680 digital signal processor. The dedicated chip, which launched with the Snapdragon 820 last year, is specifically designed to speed up video and photo processing and virtual reality apps. In addition, it packs the Snapdragon Neural Processing Engine SDK, TensorFlow, and Hallide Frameworks, making it the first 600-series chip to support Qualcomm’s new artificial intelligence platform. The 630, by contrast, is a pared-down model destined for cheaper devices. It sports eight older cores — four Cortex-A53 cores at 2.2GHz and four Cortex-A53 cores at 1.8GHz — and a slower Adreno 508 graphics. And unlike the 660, its LPDDR4 support maxes out at the slower 1,333MHz variety (up to 8GB). Despite the two chips’ differences, Qualcomm said that the Qualcomm 660 and 630 both offer up to 30 percent better graphics performance and between 50 to 70 percent lower power consumption (for location services) than their predecessors, the Snapdragon 653 and Snapdragon 626. And they ship with Qualcomm’s Snapdragon X12 modem, an LTE chip that debuted with last year’s Snapdragon 821. It delivers download and upload speeds of up to to 600Mbps and 150Mbps, respectively, and leverages Qualcomm’s TruSignal technology and Bluetooth 5 to optimize voice quality, improve battery life, and extend network coverage. Another shared highlight is Qualcomm’s Quick Charge 4 technology, which was previously exclusive to the Snapdragon 835. The 660 and 630 can charge 20 percent faster and 30 more efficiently than Quick Charge 3.0, Qualcomm said, which translates to five hours of talk time in five minutes and 50 percent battery in 15 minutes of charging. 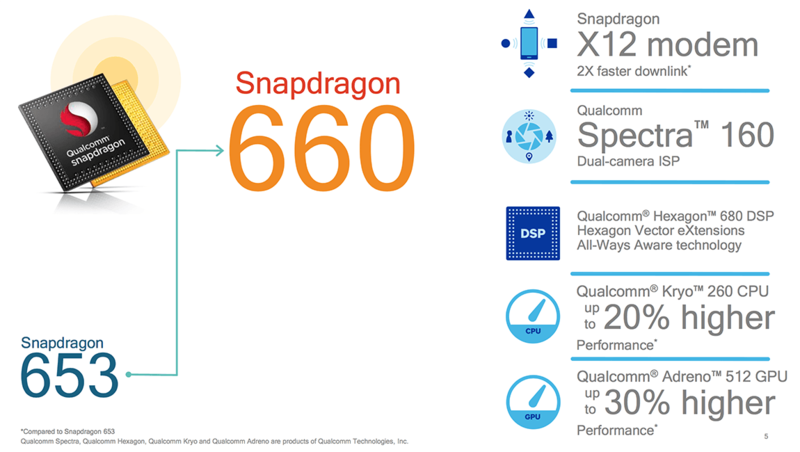 Both the Snapdragon 660 and 630 pack Qualcomm’s Spectra 160 image signal processor (ISP), which supports many of the sames features as the Spectra 180 ISP in Qualcomm’s high-end Snapdragon 835. Hybrid autofocus is in tow, plus phase-detect autofocus, electronic video stabilization, dual-camera focal length adjustment, bokeh effects, and enhanced low-light processing. It won’t be long before the new chips make their way to devices. Qualcomm said the Snapdragon 660 is shipping to its device partners now, and that the Snapdragon 630 will ship later in May.